Eat, sleep, walk, swim, run, bike, golf, repeat. A fitness tracker captures it all. Here's what recent research is telling us about these devices. Fitness trackers, research is showing, are providing health and wellness motivation for the millions of people who use them. Fitness trackers are popular! In fact, the fitness tracker market will reach $30 billion by 2020, according to industry estimates. When these fancy little devices were initially produced, they were elementary: basic step-counting tools. But the companies who make them began releasing more and more upgrades over time, meeting consumer demand for all the bells and whistles. The results: Today, fitness trackers are 24/7 health and wellness machines, with the ability to monitor just about everything you do: caloric and nutrient intake, quantity and quality of sleep, sports performance, heart rate, VO2 max (the maximum rate of oxygen consumption measured during incremental exercise), and much more. But, do fitness trackers measure up to all the hype and expense? 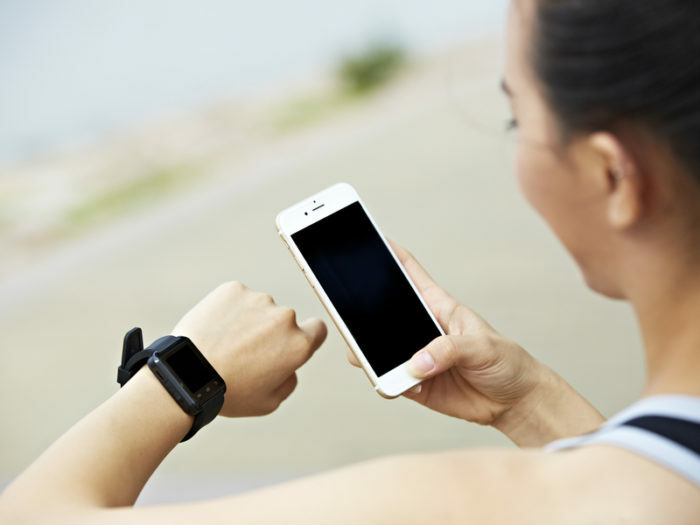 Research has suggested that many consumer fitness trackers, smartphones, and smartphone applications provide similar accuracy in terms of steps, sleep, and heart-rate tracking. In fact, they’re so accurate, they can even help detect health problems like heart arrhythmia and sleep apnea. A massive study released in December 2015 analyzed research for two major fitness trackers: Fitbit and Jawbone. The purpose of the systematic review was to summarize the evidence for the validity and reliability the activity trackers and their ability to estimate steps, distance, physical activity, energy expenditure, and sleep. This results indicated high reliability in all devices for steps, distance, and energy expenditure, with a low reliability for sleep except for certain Fitbit models. In another study of the Garmen Vivofit, the accuracy in assessing energy expenditure and step count were examined. Thirteen participants wore the Vivofit fitness tracker for five days. The participants underwent BMR (basal metabolic rate) lab testing and treadmill walking tasks at various inclines. The results indicated that the BMR values estimated by the Vivofit were similar to the values measured through indirect calorimetry (IC). Furthermore, the Vivofit provided an accurate estimate for incline walking (although it did underestimate step count for level walking), and there was a strong correlation between energy expenditure and the exercise intensity. In conclusion, the researchers noted the Vivofit activity tracker was on par to accurately track physical activity. Since many fitness tracker users are athletes, the devices’ ability to track heart rate is appealing. By tracking heart rate, you can accurately measure the duration of exercise intensity minutes (time spent in your heart rate zones). In a 2016, a research study was published on four popular fitness tracker devices: Apple Watch, Fitbit Charge HR, Samsung Gear S, and Mio Alpha. They examined the ability of the devices to measure heart rate and energy expenditure at rest and during exercise. During the study, 22 healthy volunteers completed protocols involving supine and seated rest, walking and running on a treadmill, and cycling on an ergometer. Data from the devices collected during the protocol were compared with reference methods: electrocardiography (heart rate) and indirect calorimetry (energy expenditure). The results showed that the devices accurately measured heart rate. However, estimates of energy expenditure were poor. As you can tell from the above-referenced studies, the assorted fitness trackers have varying levels of accuracy, depending on what exactly you are trying to track. However, on a rather interesting note, regardless of your activity tracker or fitness app preference, there is evidence which shows these devices can help with weight loss. But, how exactly does this work? Furthermore, a study published in the International Journal of Behavioral Nutrition and Physical Activity analyzed behavior-changing techniques from 23,490 and 17,756 smartphone apps categorized as Health and Fitness in the iTunes and Google Play store, respectively. The study demonstrated that apps promoting physical activity applied an average of five out of 23 possible behavior change techniques (such as self-monitoring, feedback on performance, and goal-setting). Using a Fitness Tracker: Is it Worth It? In one word, how do fitness trackers and apps promote weight loss and improve health? Motivation. The key to weight loss or even enhanced athletic performance is based on behavior change. And the best way to change a person’s behavior is to give him or her the proper motivation. Simply put, fitness trackers work because they are a constant reminder to each of us to think about (even dwell on) their health and wellness. When you add the social component and sharing capabilities that many of the fitness trackers encompass, you significantly increase the motivation. A fitness tracker won’t turn you into a supermodel overnight, but it certainly elevates your passions toward achieving your final goal. So, yes, using a fitness tracker is definitely worth it. International Journal of Behavioral Nutrition and Physical Activity. Dec 2015, 12(1). Journal of Medical Engineering and Technology. June 2016, 40(6). Plos One. May 2016, 11(5). International Journal of Behavioral Nutrition and Physical Activity. 2014, 11(1). Frontiers in Public Health. 2017, 4.
activity tracker, add, aerobic exercise, apnea, cancer, cardiovascular, cardiovascular fitness, dementia, diabetes, exercise, fitness, fitness tracker, health, health and fitness, health and wellness, health problems, metabolic rate, nutrition, physical activity, sleep, sleep apnea, yoga for beginners. I am not sure that trackers are accurate. I use a fitbit charge 2 which revords steps while I am inactive. Also I count my steps and comparpe with the tracker and there is aoways a huge difference. I thought you might be interested in this article on https://universityhealthnews.com: You're Using a Fitness Tracker—Is it Worth It?